Nothing like getting the juice right from the orange. An executive who toils for the largest carrier in the world, China Mobile, let the cat out of the bag on his Weibo account regarding Xiaomi's new budget priced handset. And not only did this executive reveal the specs of this new phone, he also posted a picture of the device that he has had for some time. According to the China Mobile executive, this device will feature a 4.7-inch screen with a resolution of 720 x 1280. Powering the handset will be a quad-core Lead Core LCI LC1860C CPU (say that five times fast) with the Mali T628 GPU crunching graphics. 1GB of RAM is inside and there is 8GB of native storage. Despite the budget tag, a 13MP snapper is on back and there is support for 4G LTE Cat.4 which will allow a maximum download speed of 150Mbps. Previous rumors about this model add a 2MP front-facing camera, microSD slot and Android 4.4.4 pre-installed. As far as pricing is concerned, we have to turn to another executive. 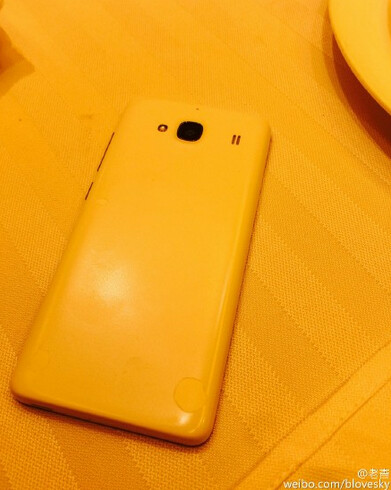 Xiaomi CEO Lei Jun recently stated that the company will not release a phone priced as low as $64 USD. So we do have a floor when it comes to how much this budget model will cost. What we don't have is a possible date for the unveiling of this handset, or a name for it. Too much yellow in the leak photo. Is that iphone 6 camera? I guess one of the main reasons is no marketing where other companies spend more money. Hate Xiaomi all you want, but a phone with 720p display, Quad-core processor, 13 MP snapper, microSD slot, Android KitKat out of the box, all at a price of around $70 is an amazing achievement. Well spoken, or well typed I should say. I thought I was the only one who read it right. Guys the article mentions that the phone will not be the amount mentioned. Meaning we have a Base price level, for all we know it might 100$ or 200$.